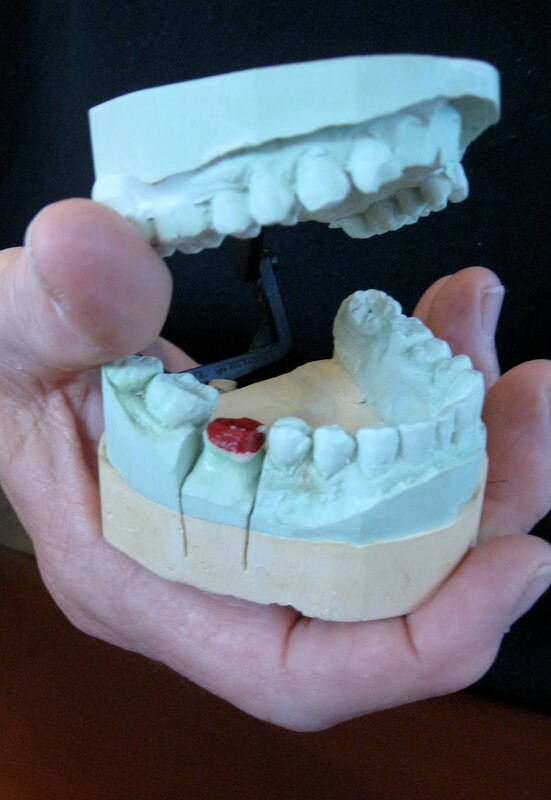 The gross-looking mold above is an artifact of dental work to install a crown on a broken molar decades ago. Once the process was successfully completed, the dentist asked if I wanted to keep the mold. I did, and in recent years it has proved an element of Halloween décor fascinating to our grandchildren. They love to open and close the hinged upper and lowers. But most of all they like to pull out the tooth, painted red, that was destined for the crown. The mold never stays in the same place when any of the grands are around during that season of the year; but so far, somehow even the youngest ones always manage to return the red tooth back into its spot among the other teeth. Memories of a dental embarrassment involving that same crown bubbled into my thoughts recently during my discomfort, and yes, embarrassment, at having teeth and gums magnified digitally and displayed on a huge screen during a visit to the dentist. On a particularly late Friday night session in the early days of my public relations work at a marine research lab, a co-worker who worked a night shift came by. Our office always had a basket of candy, and the late-night visitor picked out a long-lasting caramel sucker. Thanks to Google, I think I have identified the brand--Sugar Daddy. Her obvious enjoyment of that candy during our conversation propelled me away from the computer and straight for the candy basket. I relished unwrapping the bright red and yellow paper, something I hadn’t done since I was a child. I popped the narrow rectangle of caramel into my mouth and sucked on it contentedly, absorbing both the caramel taste and the information I needed about my visitor’s research. The problem came when I opened my mouth to ask a question. I pulled out the sucker. Embedded in the candy was the crown off one of my molars. Yikes! What would Emily Post do? My dentist was embarrassed that the crown had come off and was ready to meet me at his office. But I was experiencing no pain. Maybe Sugar Daddy suckers are also pain inhibitors. We met the following Monday for a superglue-job that has held for a dozen years so far. Needless to say, Sugar Daddy is no longer one of my approved treats, but I still cling to the memory of that wonderful, slow-release caramel flavor and texture. *I borrowed the Sugar Daddy image from A Candy Store. 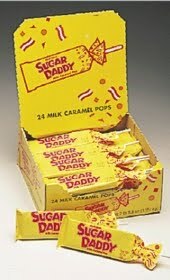 I loved Sugar Daddy's and Big Hunk candy bars as a kid. My teeth have paid dearly for the sweet goodness of the candy. Crowns and me aren't the best of friends.